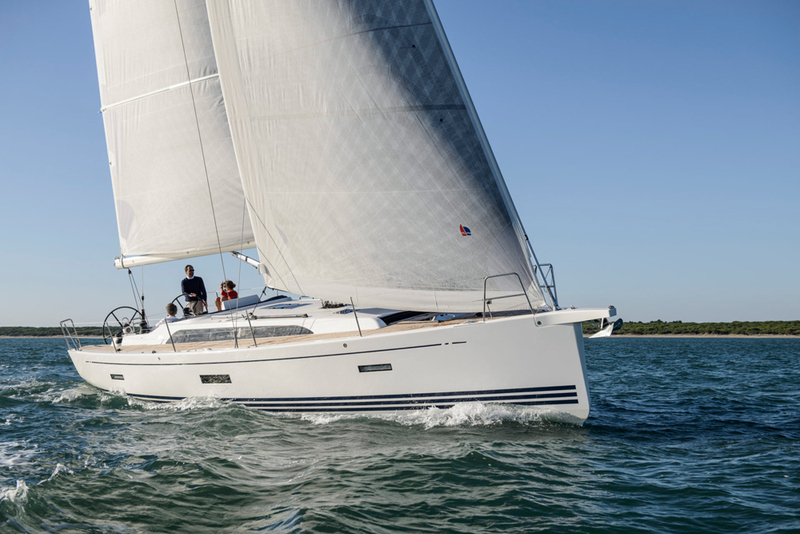 This new sailboat is so much fun to sail, you’ll forget where you’re going. Enthralled with watching the 1,000-plus square feet of sail area above my head, I tacked the X-Yachts X4 with just fingertip control on the wheel. I noticed the boat’s responsiveness, and how easily the 106% jib came through the foretriangle, and that’s when it happened—we came to a slow, mushy stop in the mud of Chesapeake Bay. Thoroughly enjoying the blowy day and the nice turn of speed, I had completely lost track of the markers and executed a perfect, if embarrassing, soft grounding. I don’t usually get distracted so easily but the fun of sailing this very modern. good-looking speedster called the X4 got to me. Luckily, we pivoted, broke the suction of the mud and were off again very quickly, giving me time to evaluate the boat as a whole. The X4 is the second model in the Danish builder’s new line, positioned somewhere between their Xp (performance) models and their cruising offerings dubbed Xc, like the Xc 45. The 41-foot X4 follows in the footsteps of the X6 that launched last year. The target market is the sailor who would rather forgo the intimidation of the race-oriented Xp but can’t quite settle into the cruising mode of the heavier Xc. This new approach, placed somewhere in between, is an amalgam of two good things that work better together. X-Yachts co-founder and designer Niels Jeppesen created this new mid-range model with two inches more beam and a bit more freeboard for comfortable accommodations below. The vacuum-infused X4 is only eight percent heavier than the performance line, but still includes the trademark steel grid that helps spread keel loads and stiffens the hull. Larger fuel and water tanks as well as more battery capacity have been incorporated for extended voyages. 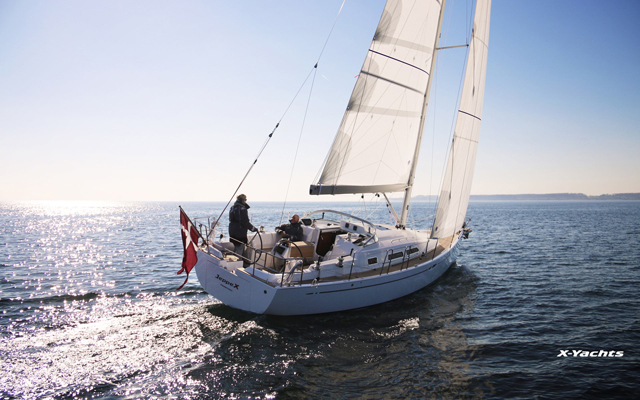 For better performance, there is a choice of drafts (6’ 1” to 8’ 3” with either a T- or L-shaped keel with a bulb). The encapsulated keel is strong, so small groundings like ours are hardly worth a mention. The fractional rig includes a keel-stepped, aluminum Selden mast with double spreaders and discontinuous rod rigging. A carbon mast is optional. 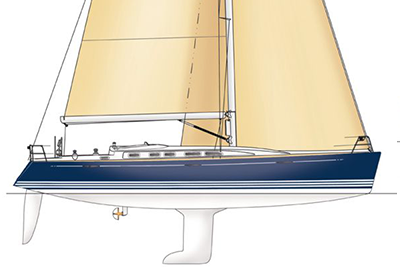 Spectra halyards are led aft below deck to rope clutches in the cockpit and there’s a manual or hydraulic backstay adjuster. The double-ended mainsheet is led aft to two self-tailing Harken winches and the traveler bisects the cockpit sole into which it is recessed. A great place to sit and drive is just in front of either helm on the side deck. From here, you can reach the wheel, the genoa sheet on the primary winch and the control line for the traveler. 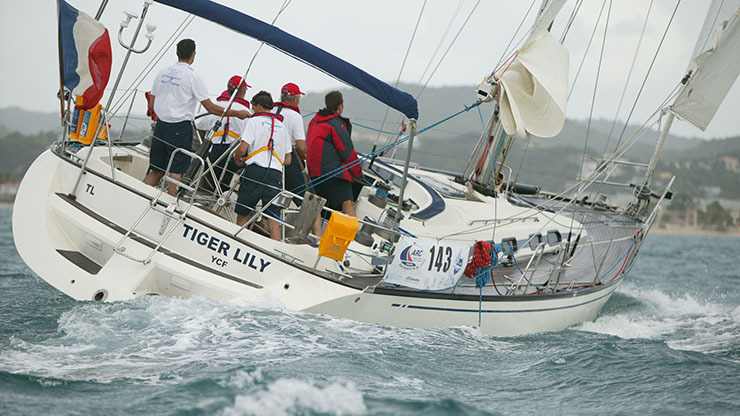 Sight lines forward are excellent, providing a clear view of the headsail telltales. Once unstuck, we found a perfect day on the Bay. With 12 knots of breeze and the classic (traditional hoist mainsail) we sailed 7.9 knots at 38 degrees apparent wind angle. Pointing this high is what X-Yachts performance is all about. With the asymmetrical spinnaker, we cruised at 8.4 knots at 120 degrees. The water was flat so we had no chance of experiencing upwind pounding but with the fine entry and hull chine, the X4 tends to slice through chop efficiently and accelerate nicely when she finds her sweet spot. Both the bow and the stern are places that may be customized. Choose between an open transom and one that drops down to form a swim platform. 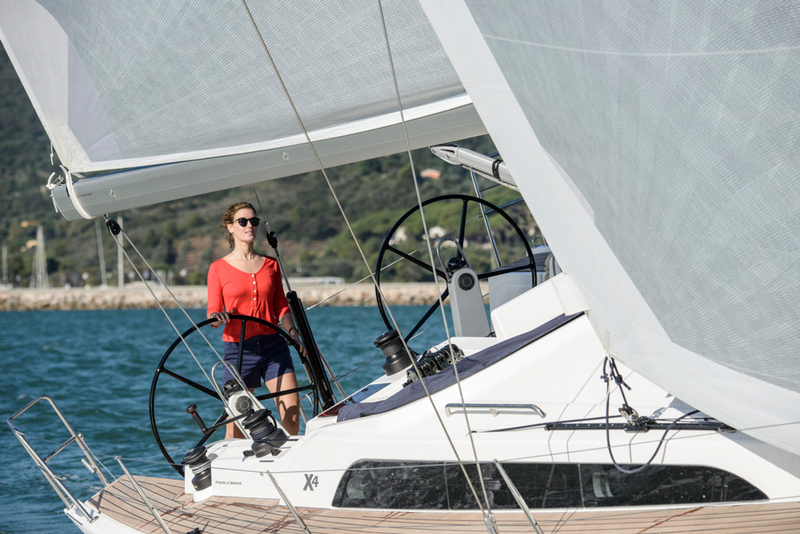 Also, three bowsprit configurations are offered including a standard composite cowl with an integrated anchor fitting, an extended carbon sprit with an anchor roller, or just the carbon sprit with no roller. With the roller, the anchor is tucked under the sprit, which keeps both the deck and the profile cleaner and free of snags for lines from a Code 0. Other on-deck options include an integrated windshield, electric winches, fold-down cleats and teak side decks. Our boat had the optional Carbonautica composite wheels that add a bit of racer flash and feel really good in the hand. Stainless-steel wheels with a leather covers are standard. You can also choose between a fixed (standard) or removable cockpit table. The latter will be easier for club racing with crew. With the removable table, twin 12” B&G chartplotters (Raymarine is also available) can be mounted atop the angled pedestals. Otherwise, an MFD is mounted at the aft end of the fixed table. The cockpit is wide but short, and that makes it easier to sail with only two people. However, the settees are also short so lounging about would be better done on deck rather than on the seats. Four layout options are available with various configurations including two or three cabins and one or two heads. Regardless of the choice, the master is always forward with an island bed and drawers below. Here, an ensuite wet head is optional. When only two cabins are specified, the aft head moves back and becomes larger—although it still doesn’t incorporate a proper shower stall. In this configuration, there’s room for a dedicated, forward-facing navigation station. With three cabins, the starboard head is moved forward and is smaller while the nav desk becomes aft-facing, sharing the seat with the starboard settee. Note that the large number of options (both inside and out) result is a wide price range for the X4; while the base boat is $310,000, our boat as-tested hit the $450,000 mark. A definite European aesthetic is evident below. The standard finish is T-Tech engineered wood, which is a darker and almost teak in color, while the optional O-Tech is a light oak. Our test boat had the latter and the color served to make the interior feel larger. The L-shaped galley is to port at the foot of the companionway. 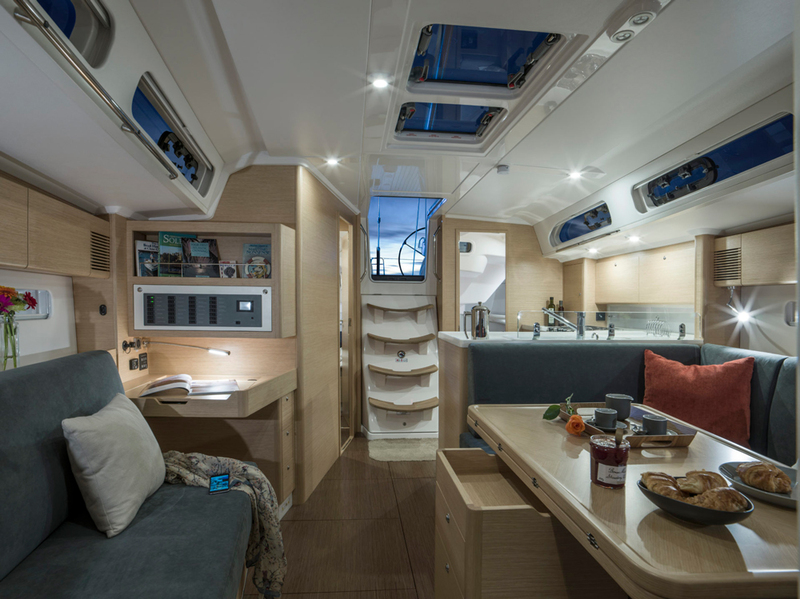 In the galley you’ll find twin sinks, a gimbaled Eno stove/oven combination and Isotherm top-loading refrigeration, which means nothing is lacking for weekending and entertaining. Stowage options are plentiful in drawers and lockers all around. A U-shaped settee just ahead wraps around a fold-out table, so there’s plenty of room for everyone at mealtime. For cruising couples, the best layout may be the two-cabin, single head version that includes the aft-facing nav desk. This configuration feels less cramped for when the guests are occasional or the kids are grown. Some may argue that X-Yachts’ new middle-of–the road approach is neither fish nor foul and that a racer/cruiser is both and neither at the same time. 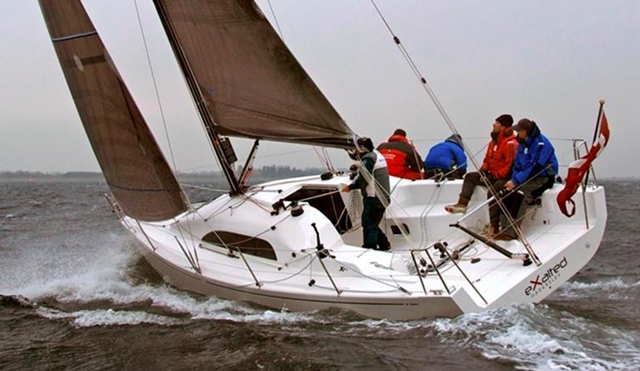 Then again, read Sailboats: What’s a Racer/Cruiser and you may well reach the conclusion that this is exactly what many are looking for in a sailboat. Boats today are asked to be multi-faceted solutions that do everything well. This isn’t easy, but the X4 brings together the best of performance and cruising amenities and it does so seamlessly. In fact, you may find yourself enjoying the ride so much, you’ll forget where you were headed in the first place. 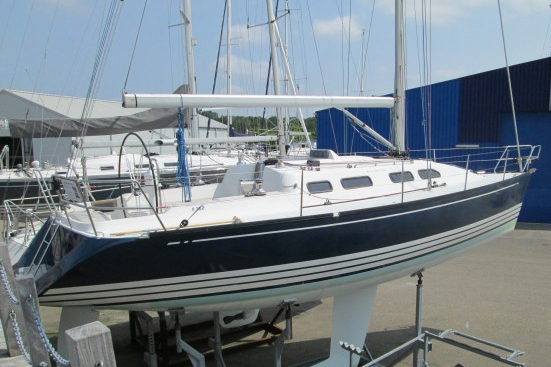 Other Choices: Interested shoppers will also want to see the Dehler 42, another innovative racer/cruiser. 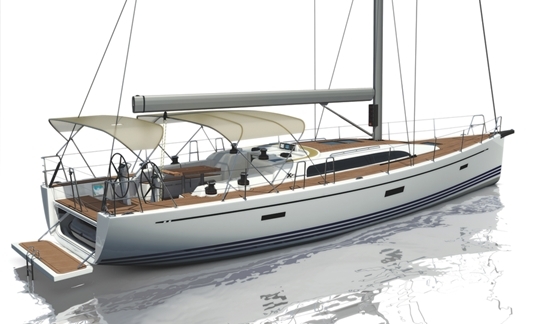 The Solana 41 is also likely to be of interest. 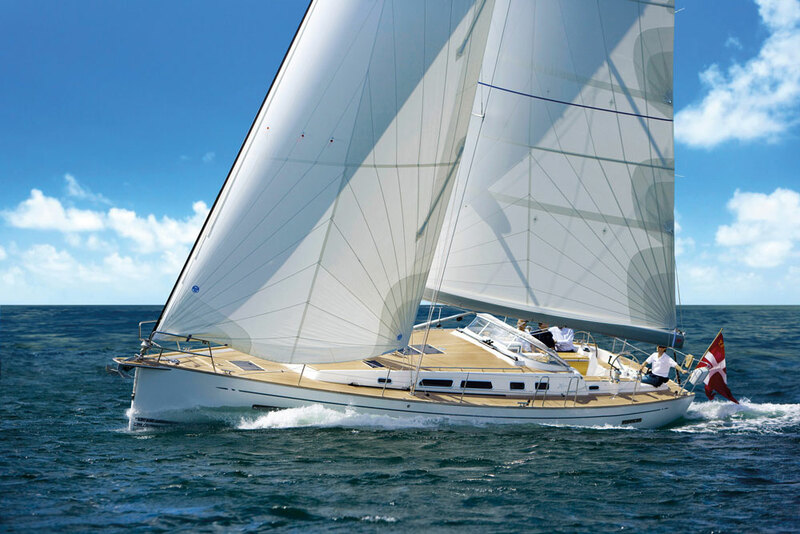 For more information, contact X-Yachts. Sail area 1,044 sq. ft.